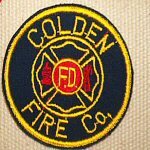 Colden Firefighters responded on 1/7/18 at 0010 Hrs for a report of a chimney fire on Hayes Hollow Rd. Colden 9 went on location reporting a fully involved structure. Armor, Boston, East Concord, Holland, North Boston, Wales Center, Langford, & Chaffee-Sardinia responded as mutual aid to the scene. Hillcrest, West Valley, Patchin, & Springville, provided fill in companies.